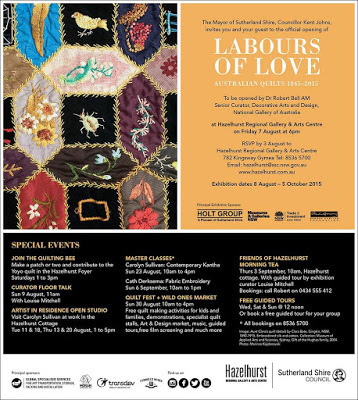 Labours of Love 1845-2015 Hazelhurst Gallery | Eastwood Patchwork Quilters Inc.
Labours of Love explores the history of quilting in Australia with exhibits dating from the mid 1800s to the mid 1900s in chronological themes: Traditions from Home (Identity, domesticity and gentility); A Virtuous Past Time (Skill and taste on show); Patriotic Voices (Nationalism and participation); Remember Me (Family, friendship and love); Utility and Thrift (The beauty of making do); and Best in Show (Honouring and maintaining the craft). Interspersed within these themes are contemporary works by 11 artists to illustrate current engagement with quilt making. Artists include Judy McDermott, Jan Irvine-Nealie, Judy Hooworth, Pamela Fitzsimons, Carolyn Sullivan, Lucas Grogan, Adrienne Doig, Emma Peters, Paula do Prado, Gillian Lavery and Belinda von Mengersen. During the exhibition, the Quilters Guild NSW will also present a contemporary quilt exhibition in Hazelhurst Community Gallery from 29 August to 8 September 2015. The exhibition will display entries from a national competition showcasing the expertise of the Guild members and quilting groups from across Australia.